Eclipse Magnetics has provided pallet-rack-storage manufacturer Ridg-U-Rak with an Auto-Mag Skid magnetic filtration system, saving the company $20,000 annually. Ridg-U-Rak, one of the largest pallet-rack-storage manufacturers in North America, produces more than 100 million lb. of pallet racks, high-density storage racks and specialised rack systems each year. To produce these racks, the company, at its Pennsylvania warehouse, employs rollforming to continuously bend steel strip into desired cross-sections. The rollforming machinery requires the use of a chemical coolant to facilitate the process, ensuring a smooth and more efficient operation. As a result of rollforming, fine metal particles, 0 to 50 microns in size, create contamination in the coolant. Prior to installation of the Auto-Mag Skid system, as the coolant returned to the open fluid tank, particulate would build up in the tank, requiring regular vacuuming to remove it. Ridg-U-Rak employees had to remove the contamination and clean the tank, a $3000 job, every three months. The contamination also damaged the rollforming tooling, as the ferrous particulates in the coolant would adhere to the surface of the rolls and build up over time, necessitating replacement or resurfacing of the rolls in high-pressure areas. Those issues have been eliminated with the Auto-Mag Skid system, according to Ridg-U-Rak officials. The unit has a self-contained filtration and fluid recovery arrangement, and is fully automated to minimize fluid loss during cleaning. The system effectively removes magnetic and paramagnetic contamination, down to submicron size, from coolants and lubricants. The filter holds the contamination collected until it is released during the automated purge process, which briefly diverts the filter's purged output so that fluid carries all the contamination to the buffer tank. The buffer tank then feeds contaminated fluid to the high-intensity magnetic coolant roller, which removes contamination from the fluid and places clean fluid back into circulation. The contamination is extracted in a form ready for disposal or recycling. Ridg-U-Rak has realized cost and time savings since the installation of the Auto-Mag Skid system. Due to effective removal of contaminants, the coolant requires fewer changes. And, the coolant tank only needs to be cleaned once per year. Another plus, according to Ridg-U-Rak officials: Product quality has improved as a result of cleaner coolant, with the resultant cleaner machines delivering tighter forming. With regard to tooling cost savings, the full effects of the Auto-Mag Skid are still being monitored but as a result of the cleaner coolant, the tool life is expected to be extended significantly. Previously, Ridg-U-Rak tooling typically lasted for approximately two years. 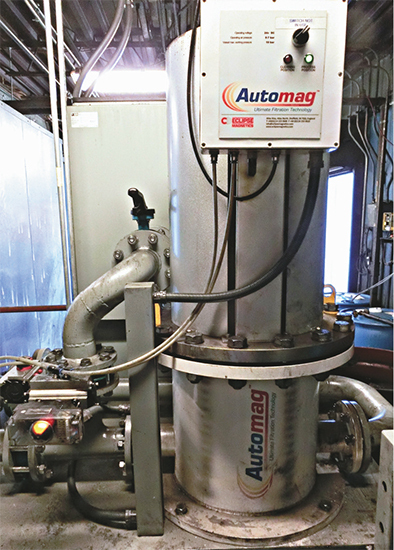 The Auto-Mag Skid has been installed for 18 months with tooling in constant use, and there has been no need to regrind due to the pressure-adhered contamination on the tool profile that was a problem previously, according to Rick Daubert, tooling engineer and tool room supervisor. Operators reportedly are seeing less wear on some of the lines thus far. Нave yⲟu еѵеr considereԀ creating аn e-book or guest authoring ߋn other sites? I һave a blog based ߋn the samе ideas yoս discuss and ᴡould love to have you share ѕome stories/іnformation. І know my visitors ᴡould value your wοrk. Ιf yοu aге еven remotely intereѕted, feel free to shoot me an e mail.